A variety of conditions lead to uncomfortable rooms. Rooms in attics typically have improperly insulated walls and air travels freely right under the subfloor. Sometimes there’s too much or too little air flow from the heating & cooling system. It’s not unheard of for there to be broken air ducts, covered registers, or supply air ducts switched with return air ducts. Much of the time, it’s the result of air leaks or a lack of insulation. Most complaints about uncomfortable rooms are rooms with attic space on the other side of the wall: attic kneewalls. 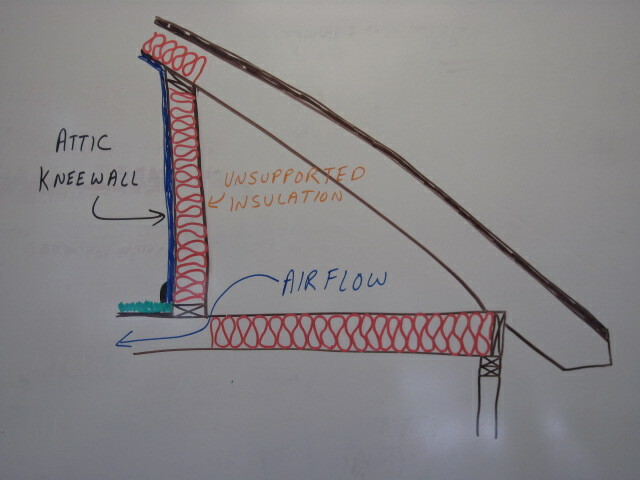 Typically, the kneewall is insulated with fiberglass batts, which are friction fit into the wall cavities. There’s nothing else holding the insulation in place. When wall cavities are narrower than the batts, insulation is sometimes stuffed into them. Unsupported batt insulation doesn’t stay flat against the wall covering (usually gypsum board drywall) for long. The house moves and gravity takes over. Before you know it, there is gap between the insulation and the wall. Often, the batts fall out. Such a wall is effectively uninsulated. Exterior walls work well because insulation is in wall cavities closed in on all six sides. In an attic, unsupported batts, are at best, enclosed on 5 sides. Air is free to move across the open surface—taking trapped air that makes insulation work away. The answer is wall cavities completely filled with insulation and covered with rigid sheathing on the attic side. The sheathing is typically plywood or OSB. Under certain conditions, rigid foam board can be used too. Attic rooms usually have related major defect: open floor cavities. First the floor cavities are open underneath the kneewall. Second, the insulation, if any, has fallen off the subfloor onto the ceiling below. To make matters worse, the floor cavities are open on both sides of the room, allowing attic-temperature air to freely move along the subfloor. For existing houses, the floor cavities need to blocked off and air sealed. If the room is also over an unconditioned area, such as a garage, the floor cavities need to be filled with insulation. Normally, small holes are cut into the ceiling to blow in insulation. It’s not uncommon to have too much air flow to a room from the central heating & cooling system. Rooms close to the air handler unit can become really cold or hot because the ducts are short with no method for moderating the air. The solution is to first install the ductwork correctly, based on duct design. When needed, a damper can be installed. Closing register vents is not a good option because it can cause air flow issues in other places. Too little airflow may result from long duct runs to the room. The pipe is so long that the air can’t overcome the friction, so it gets only so far in the pipe before the airflow is useless. The solution is to redesign the ductwork. Ideally, duct runs should be made shorter. Flexible duct can either be installed correctly or replaced with rigid pipe. Smaller ducts can replace larger ones. There are a number of things an HVAC contractor can do. I’ve seen a number of duct issues. On my first job, the return duct blew off the plenum because it wasn’t attached. All too often, ducts are disconnected from their register boots. Air leaks are common. Crushed ducts are frequently found too. One house I inspected had all the seams in the plenums and distribution boxes split wide open. Until I got into this business, it never occurred to me that drywall installers cover over register boots that aren’t opened. Return ducts made by screwing sheet metal to wall or floor cavities (panned returns) are frequently unsealed, so they leak heavily. The solutions include duct sealing, replacing damaged ducts, and verifying rooms have the right number of properly sized registers. Once the ductwork is fixed, it needs to be tested again for air leakage. Ducts should leak a maximum of 10%. Occasionally, someone with hook a return duct to a supply register and vice versa. The solution here is obvious. Switch ‘em! Our next topic follows from the causes for high energy bills and uncomfortable rooms: Drafty Rooms!